Offering you a complete choice of products which include industrial masking tapes. Masking Tapes - is a type of adhesive tape made of easy-to-tear paper backed with a relatively weak adhesive. It is used mainly in painting, to mask off areas that shouldn't be painted. The adhesive is the key element to its usefulness, as it allows the tape to be removed without stripping off newly-applied paint. Crepe paper coated (Masking Tape) with rubber based adhesive with high technology that it won't leave any residue on the surface. Their are general purpose, high tack, automotive and high temperature grades made with different types of adhesive. Feature: Natural coated, good conform ability, strong holding power, easy removal, smooth trimmed edges and no residue on surface. Usage: Used for holding, bundling and sealing. Widely use for color separation and painting made by hand or by spray. High temperature masking tapes are used in automobile industry for doing painting in oven booth. 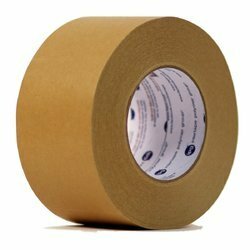 Looking for Industrial Masking Tapes ?